Oh my goodness, is it already Friday? I've got plenty to show you, but I always forget how long the blogging takes. and when I saw this pattern come out last fall, I just had to have it! 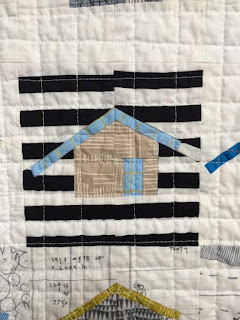 So, when I was ready for a new start, I pulled out the pattern and . . . . . . NO!!!! It's that "paper piecing" that everyone keeps talking about that I have steered far away from. It was a bit slow going at first, and there were some lessons to learn along the way. 2. it pays to invest $10 in a package of Carol Doak's Foundation Paper, 100 sheets. It's just like that thin paper we wrote on as kids a gazillion years ago. 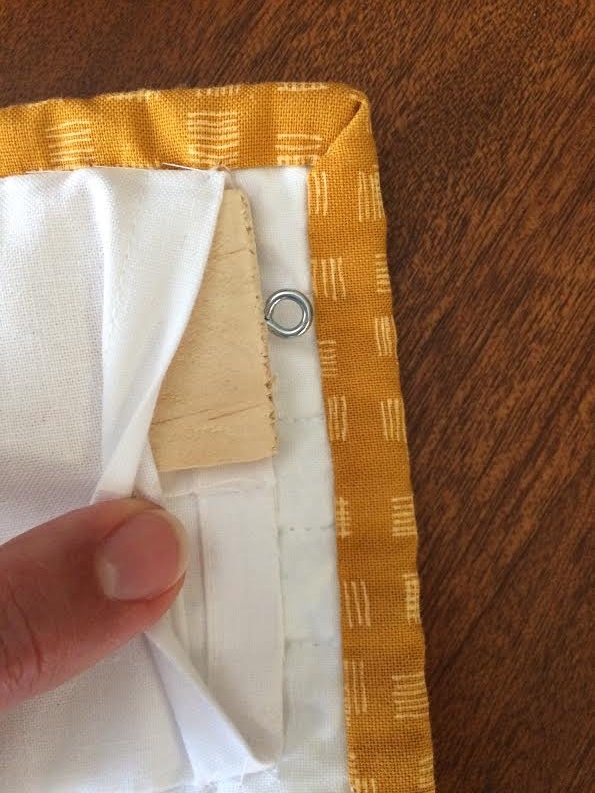 3. keep your seam ripper close by. 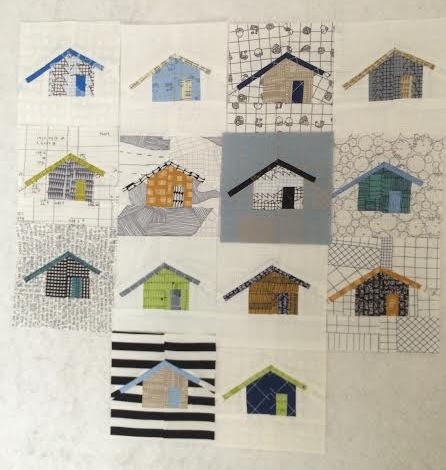 These houses took me about an hour each, they're only 5" square, yikes! I hope you're impressed. Slowly, they started to stack up. 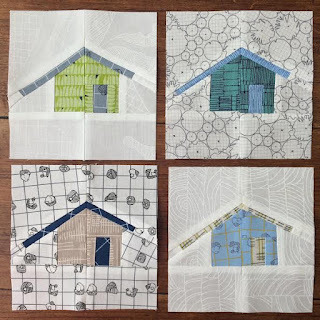 At this point, I was seriously considering a "4 outhouse wall hanging". 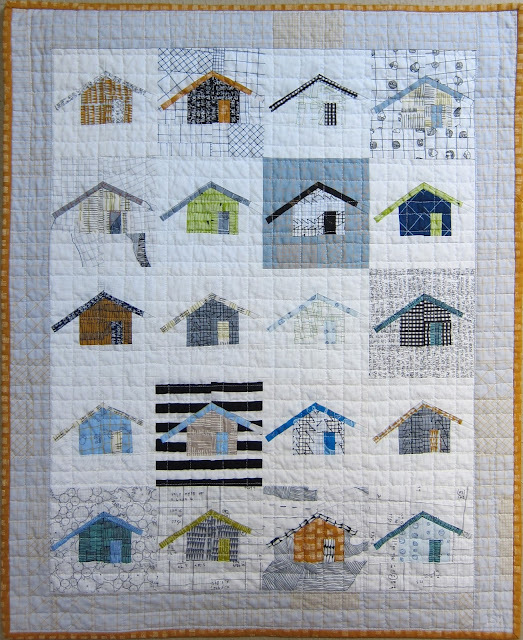 then an 8 house wall hanging . . .
Ok, I mostly love them all. I even took the time to make a sleeve for hanging purposes. I've tried using the clear thumb tacks, that works for a while, but not long-term. I tried sewing the triangles into the corners, that didn't work (it sagged in the middle). 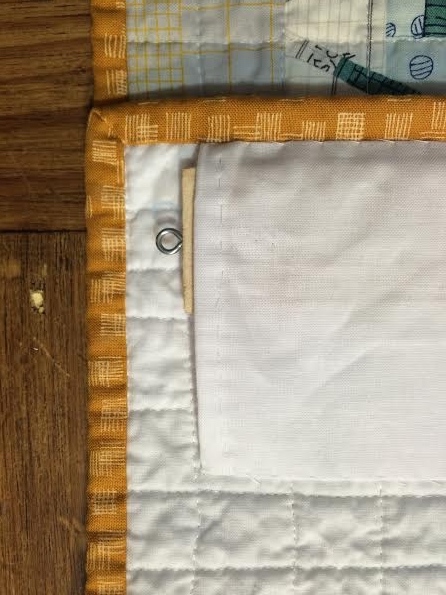 This has turned out to be a great system for hanging a quilt, my favorite tutorial is here (she learned this system from a quilt museum). I found some good instructions for making the sleeve here and here. 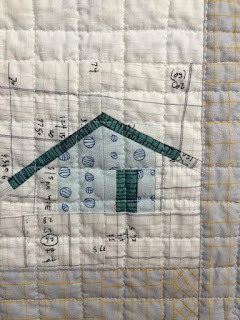 It was an investment of time (3 trips to Home Depo), but now that I've made a few and corrected my mistakes, I've got it down and find that it's a secure way to hang a quilt. I'm so proud of myself!!! 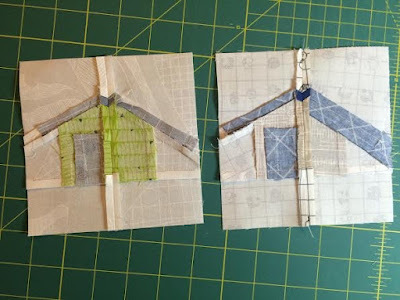 ok. seriously, if I can do this paper piecing thing, surely you can! I think my next one will be that circle of geese I keep seeing. I'd love to give away my little outhouse scraps to someone that appreciates them. 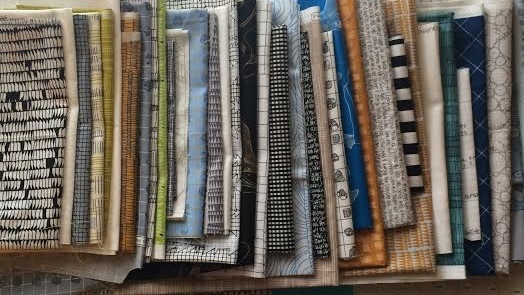 If you'd like them, tell me which 2 fabrics in that stack at the beginning of the post aren't Carolyn Friedlander's. 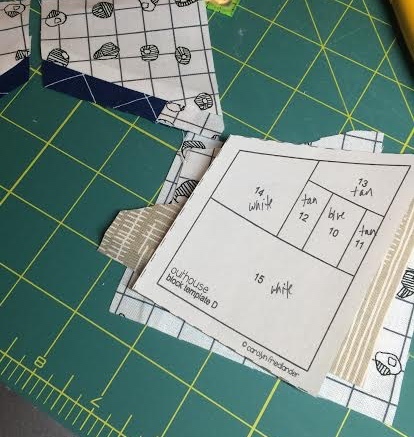 Well, you certainly picked a fairly simple block for your first paper piecing escapade. They're cute as the dickens -- and a pretty elegant outhouse, if you ask me. 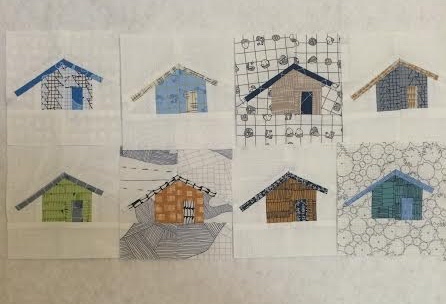 Really cute little houses, and you did great replacing those squares. I once had to pull apart a fully quilted quilt to switch two patches sewn backwards. Not an easy or quick task!! Just visiting from Finish it Up Friday. But, don't enter me in a drawing for the scraps, I have more than my share, LOL!! Love your wall hanging, it turned out beautifully!! 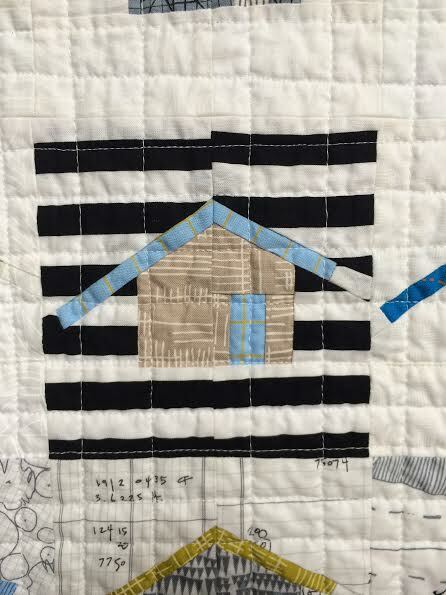 Some of the fabrics are difficult to see but I'm pretty sure that the wide black and white striped fabric is not Carolyne Friedlander's. Great little out houses. 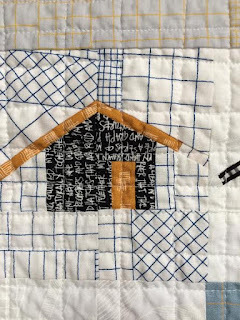 I have a quilt on my bed that needs a repair job kind of like yours did. My dog chewed open nail polish on the bed, two little spills. 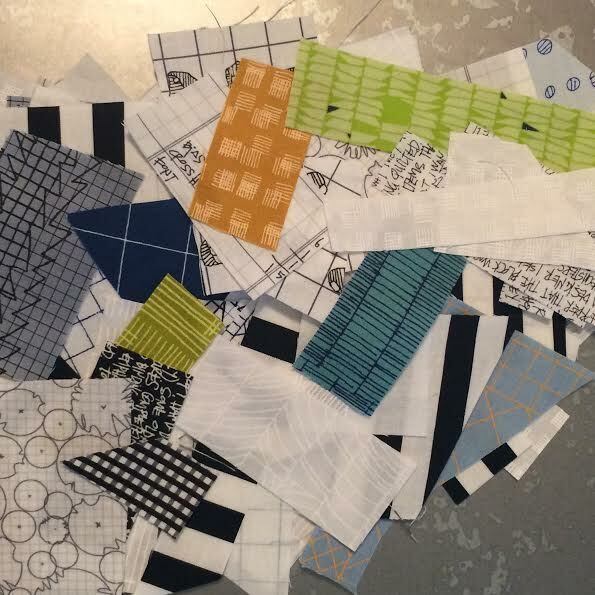 Which fabrics, The black and white strip and then maybe the black and white plaid fabric. 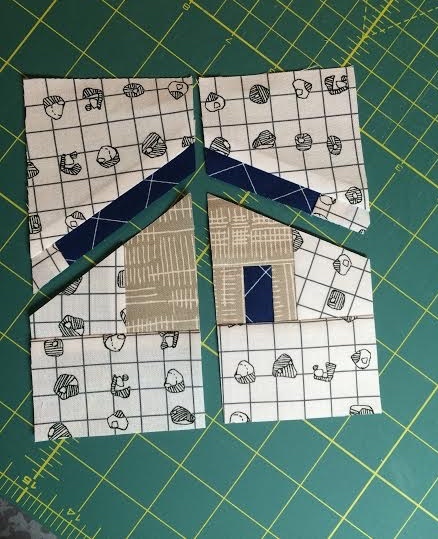 I too have forced myself to learn paper piecing during the last couple of weeks. I am beginning to really like it. I try to some every night until it becomes a natural thing. I love your houses. Paper piecing makes everything so exact. Nicely done. 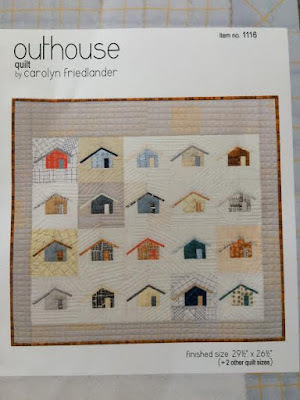 I love Carolyn Friedlander fabrics. I'm pretty sure the ones that aren't hers are the black and white stripe and the black and white check. I've been searching for the Architexture "trees" (they look like the trees in plan view on architectural drawings). Fingers crossed that I win! Nice houses. I think the black and white stripe and the black and white check. I can't guess on the two non-Carolyn fabrics but I can say that this quilt is gorgeous! I love all your fabric choices, particularly the blocks with the darker background. Beautiful. And thanks for the hanging sleeve tutorial! Love that pattern! 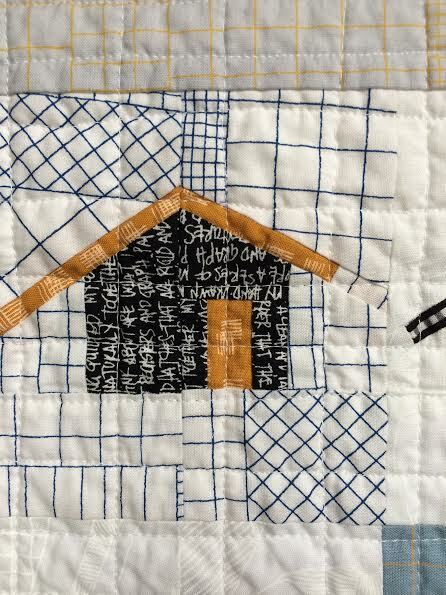 Your quilt is cool. 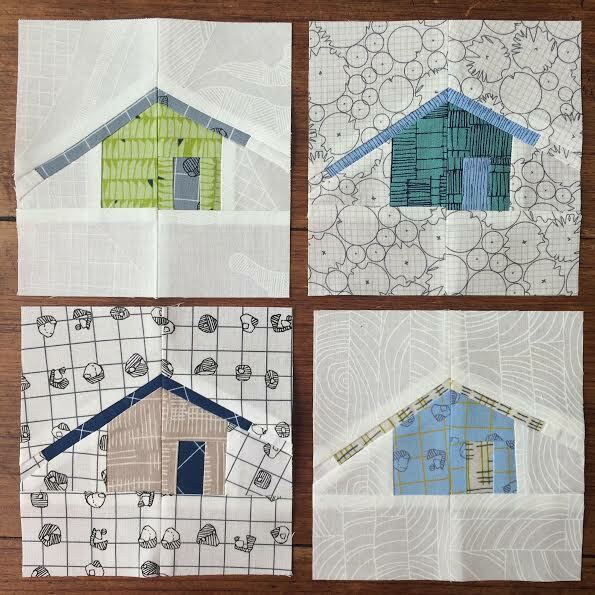 I think the 2 non-Carolyn fabrics are the text prints. i don't know which aren't but maybe the pebbles and the blue cross hatch to the left of it? 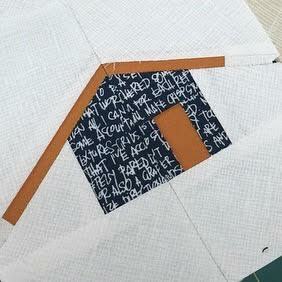 i love this pattern but i'm not into starting EPP! I love Carolyn's fabric. I think its the black and white small boxes and the black and white large stripes. I already have the pattern. Just been waiting to get enough of her fabric to make it.